Home / Everest Collegiate High School - Everest Collegiate High School Spiritual Formation / Why An Annual HS Retreat? Why An Annual HS Retreat? 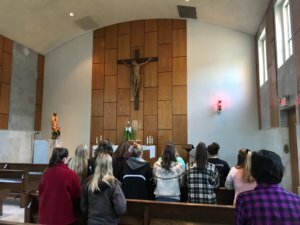 At the beginning of each high school girls class retreat the consecrated women take a moment to remind the students what it really means to go on retreat, encouraging them to make the most of this annual opportunity. The word “retreat” can be understood as a moment to withdraw from battle. Does it imply defeat? Not necessarily! At least not in the spiritual application of the term. A retreat provides an opportunity to take a step back from ordinary activities, to regroup, to reconnect with God, and to be strengthened to go back out and “fight the good fight” (c.f. 1 Timothy 6:12). Junior year can be a challenging year of high school – with its class load and the beginning of the college application process. Many of our students are also actively involved in extracurricular activities, and the junior retreat fell towards the end of the first quarter this year. 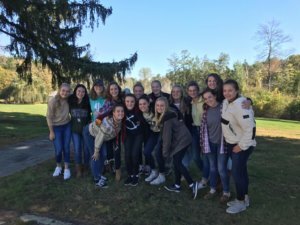 For these reason, the annual retreat proved to be a valuable opportunity for many of our juniors, and they left with renewed peace, joy, and goals, ready to enter back into the “battle” of daily life. 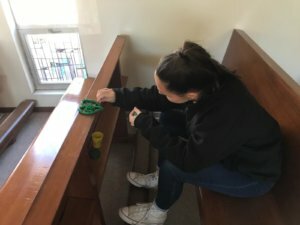 Ginny Taylor creating a playdough image of her heart as part of a reflective activity to encourage the students to speak to Jesus about their heart. 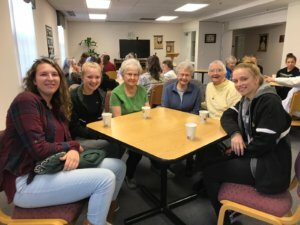 Several girls said visiting with the retired Dominican sisters was their favorite part of the retreat. Father Thomas, chaplain, celebrated Mass for the group.